Being a landlord is not easy, especially in today’s real estate market where a bad renter can cost you more to repair your investment than you were earning. But there is a trend, called home sharing, common in Europe, that is making strides in North America and could change the rental market. If you are semi-retired, single or recently widowed, this is an opportunity that can work for you on many levels. Known as home sharing, the arrangement is basically where two older persons, often women, become housemates. It is a variation on the young adult practice of roommate living, but is not much different overall. Having a compatible housemate is not only healthy for a single older person, it has many added benefits. What makes this home sharing situation work best is if the pair is already friends. It is not uncommon to see family members, often senior siblings, move in together to grow old together and share family ties. Imagine how large family gatherings, holiday visits and vacationing can fit into a home sharing setup between two family members. The chemistry already exists and what better way to grow old than with someone you already share a lot of history with? Home sharing also works with strangers who have something in common and develop a friendship over time. It is a perfect arrangement in that if you like the company and security of someone else in your home, and earn a small income as well, the possibilities are endless. Not only can you share meals with someone, you can do so much with the companionship within a home sharing partnership and still maintain a level of independence. The US Census Bureau verifies the trend with evidence that slightly more than one-percent, or roughly 500,000 women aged 50 and older are currently living with a non-romantic housemate. Add to this recent survey results of over 1,200 women aged 45 and older who say they would look at such a living arrangement favorably in their future. 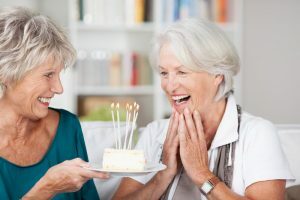 The survey, conducted by the AARP Foundation Women’s Leadership Circle, found that women in this age group were attracted to sharing a home with a family member or friend as long as private space was part of the partnership. This shows that much like having a college roommate who shared everything but had their own bedroom is a pattern that can extend into senior years. In fact, if you had success with roommate arrangements earlier in life, the house sharing as an adult concept would not be a hard transition. Where this becomes a logical solution is that in addition to having the companionship of someone else living in your home and earning some extra income as a result, there are practical pluses. They include that costs are cheaper on everything when they are split in two. That covers everything from groceries, entertainment and utilities. If you have trouble picturing how such a life transition would fit into yours consider this: The popular television show that ran from 1985-1992 known as “Golden Girls” was based on the antics and experiences of four previously married women who were living together in Miami. While the show was fictional, it did show that it was far from impossible for senior women to pool their resources and live under one roof and still be independent. That makes it a viable option to consider if you are a woman in your 50s or older living alone in a large home. Get started by reading “How To Start A Golden Girl’s Home,” available at Amazon.com.